Sorry mouikis not so good this time,don't get me wrong the pool and the views were excellent,wasn't fussed about the location as we had a car for two wks,the studio apartment let the place down,wants a refurb on all of the old apartments,but that wasn't the main problem the music going into the early hrs was,one night it carried on until 3.00am,another night it was 2.30ish am,wouldn't have minded 12 ish but come on! !,and very surprised thomas cook giving this a 3 star,send in the inspectors have no question they would take a star off!! Had a lovely holiday in September 09 in Lassi at the Mouikis Villas/Apartments. Ideal setting on a quiet road near to Mediterrane Hotel. The Villas and Apartments are in a secluded garden all with sea views and wonderful sunsets. The accomodation is excellent very clean, with clean white bedding and towels that are changed regularly. Excellent family holiday, thank you Thanasis for all your help in making the booking. Once again we got a great service from Greekstones Car Hire. Kath and Rod Kerfoot and family. We have just returned from a week in one of the villas at Mouikis. It was absolutely wonderful and we would love to go back next year. I went into Thomas Cook but they told me that the Mouikis wasn't on their books for next year. I found the Mouikis on www.kefalonia.net and sent an enquiry about availability next year but haven't heard anything. We stayed at the Mouikis Villas which are located down a hill behind the main strip. The villa was spotless, towels and linen changed 3 times a week. Kitchen well equipped and great air conditioning, which was need as the temperatures reached 40 degrees in August 2006, we are going back again August 2008 for 2 weeks and we can't wait. The views across the bay and the sunsets were unforgettable. Stunning view of Mediteranee bay, linen and towels changed 3 times in a week, full use of air con and TV. they were good sized rooms as well with a double bed and a single, althought the double was hard. 2 min walk to beach and increadably peaceful at night, sheer bliss! Just arrived back from Mouikis Village Apartments, and found them to be spacious, clean and furnished to a good standard. Unlimited use of Air Conditioning, which was great as temperatures rose to 46 degrees. Bar area was to a good standard and the pool was excellent with views over the sea and Zante in the distance. Kids played Tennis and used the pool as often as they could. Food onsite was OK, not the best but not the worst by far. Would definitely consider going back, however you really do need to hire a car, as apartments are abit out of the way and there is not a great deal in Lakithra itself. Mouikis Village Apartments was lovely, basic SC accomodation, gorgeous pool/bar area, plenty of sunloungers, beautiful view. mouikis apartsments are a long walk from lassi/argostoli. There is a road between the two towns that goes into the mainland direction. follow this all the way up the hill and you will come to it. Air conditioned rooms, tennis court, childs park, baby pool, and the wonderful cocktails beside the pool around 9.00pm with the tables and bar all lit with candles and romantic greek music makes this a great place to stay. there is a bus service that is free in the morning and afternoon that will take you in the direction of lassi to argostoli. Will be back there nxt yr!! The town of lakithra (in the opposite direction to lassi/argostoli) on the same road, it has gorgeous scenery! wonderful restaurants with the biggest king prawns you will ever see!!!! I'm not so sure about the comment about no facilities for children. Swimming pool with child section; sunloungers; parasols; pool bar with satellite TV; lounge; gardens, child play area; mini-bus service into Argostoli twice per day (except Sundays). The apartments were very clean, the pool excellent, the staff took a while to get to know us, but, when they did were very polite and friendly, unfortunately it was miles from anywhere and the transport service not good although there was a mini bus once a day. If you have children my advice is to stay away as there is nothing for them apart from the pool, no games room and no entertainment, in fact, no entertainment for anyone, it is more for older couples who want a very quiet holiday just sat around the pool, not really children orientated, although we quite enjoyed our holiday it was expensive as a car is a must. The tour rep Justin was very good, helped a lot and very friendly. Can anyone tell me how easy it is to get around the island on public transport from here? You can book Moukis Village direct and it's reasonably priced via their own website. Please could some one tell me where excatly this accommodation is, as i have been to lassi 8 times now, and have never heard or seen it, is it up a hill??? Can anyone tell me the tour operator they used to stay at Mousiki Village? We were moved to Mouikis after a compaint about our booked accommodation. Mouikis is a lovely complex in a stunning setting with great sea views & sunsets. The staff are friendly & helpful. 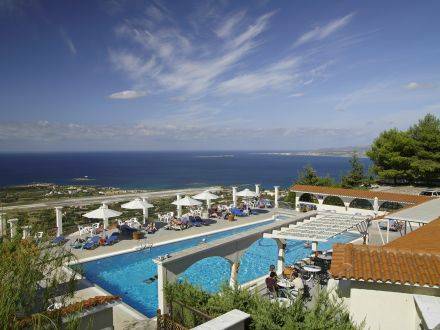 The pool is great & the pool bar is good value for food & drinks with a fairly wide choice. The only negative is that the apartment is too far from Lassi & Argostoli (where we originally booked) but the courtesy bus is a good service. The village of Lakithra was mostly closed up in October but the Bryon restaurant was superb. Best place. Hope to see you soon. A car is a must, as the Appartments are quite a distance from beaches and shops, we had 4x4 Jeep, ideal when venturing off the main roads. excellent accomodation. very relaxing. excellent views. lovely pool. nice bar. in walking distance of a village. best accomodation i have stayed in in greece. its a little far out but the place itself makes up for it. which tour operaor owns the moukis appartments?? The location of this accomodation is breathtaking the views over the bay are unforgettable. They are quiet and yet central on a small road behind the main strip. The fixtures and fittings are well due for an update but the kitchen was well stocked with pots and pans and there was a fan and a proper shower with curtain. The childrens play area is very safe and the equipment is almost new. We really enjoyed staying here. Very clean & quiet. Apart from the pool there is not a lot for the kids to do. VERY long walk to the main beach- 8km+. But a free bus runs twice a day approx. 10:30 & 16:30. If you get stuck a cab is about 7 euros. In all a very beautiful location. Sunsets to die for. Can`t wait for a return visit! !